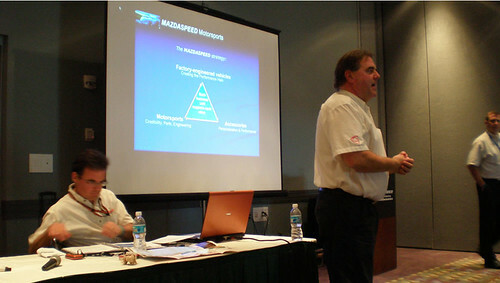 The MazdaSpeed Motorsports Development Program – hosted a very informative Seminar for improving the “off track” performance of Racers during the recent 2008 PRI Show. This seminar was designed for – and was open to “all Racers” – not just those in the MazdaSpeed Motorsports Development Program. Clearly Dean Case, Jim Jordan and John Doonan – the three presenters for this seminar – have done some forward thinking about their involvement in Motorsports. Unfortunately the seminar was posted to the events calendar at the Performance Racing Industry Trade Show – on the late side. As such – the conference room still had some seats available – but anyone involved in the sport or Auto Racing – especially drivers working to make a name for themselves would benefit from the tips and knowledge given during this session. Again these are excerpts from the seminar. Tell them what you think – as I know they are considering other ways to get this knowledge and advice “out there” to you – the Racers. This is Part One – of a Two Part Recording – and is a recorded excerpt from that Seminar. Part Two will be posted shortly. We think you will enjoy them both. AWESOME POD CAST. CAN’T WAIT FOR PART 2. ROAD RACERS MUST ACQUIRE AND IMPLEMENT.